TLP-IASbaba - Day 66 – Q 4. The constitution makers of India were all western educated and used very technical language in framing the Constitution of India. Do you think it would have been better for understanding and interpreting the Constitution if lucid language was used? Day 66 – Q 4. The constitution makers of India were all western educated and used very technical language in framing the Constitution of India. Do you think it would have been better for understanding and interpreting the Constitution if lucid language was used? 4. The constitution makers of India were all western educated and used very technical language in framing the Constitution of India. Do you think it would have been better for understanding and interpreting the Constitution if lucid language was used? Indian constitution is one of the world’s most progressive and egalitarian Constitutions. Though it borrowed many of the provisions from already existing statutes, still it is unique in itself. Beside all its good features, there are some debatable aspects. One of such aspects is “language” of the constitution. We have many examples where Supreme Court itself revisited its own judgments due to different interpretations of the provisions. On the part of government too, be it reservation policy or beef-ban initiatives, all the parties involved in debate on such policies interpret constitutional provisions according to their own interests. It could be easily understood by the majority of people who lack literacy in legal and technical terms. It would have made people more aware of their rights and it’s limitations along with their duties. It would have caused lesser controversy and subsequently lesser litigation in apex court such as in Keshvanand Bharti Case, Golaknath Case etc. It would have enabled socially motivated individuals, civil society and other organizations to have more participation in democracy. The extreme technical nature of Fundamental duties and DPSPs has created a roadblock in their implementation. 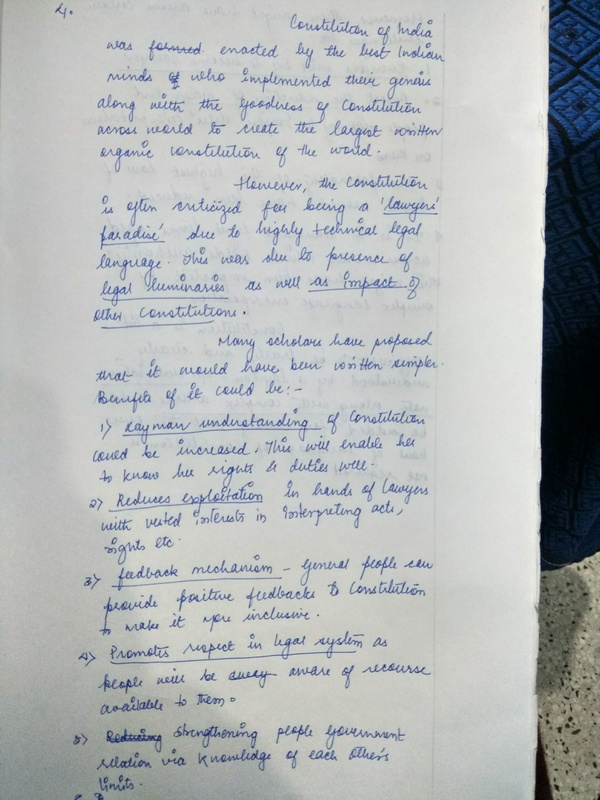 However, it must be understood that such technical and vast constitution was needed to safeguard the rights and aspirations of diverse nature of Indian population. Also the basic ideals like freedom, equality, Justice, fraternity, liberty etc helps a long way in interpretation of the constitution. 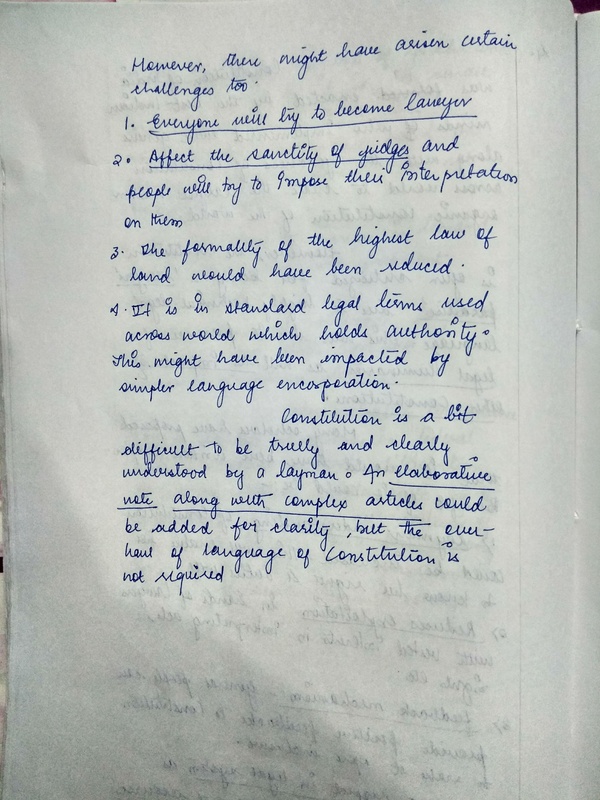 The apex court of India has always taken into consideration the basic philosophy behind the constitution along with preamble and DPSPs while interpreting various provision of constitution the greatest achievement of which is basic feature principle of Indian constitution. Thus it can be argued that a lucid constitution would have helped a great deal in understanding and interpreting the constitution at individual level this task has been actively taken up by an independent judiciary to keep balance and check on the power of executive and legislature.